Using a S4 sequence that contained both a 12CCR tree, with 6 channel star, along with other LOR elements, I am using S5 5.0.6 to test how I can update for this years show. One element would be to edit the CCR Tree and star group - which Superstar does so well. Passing the S5 group to Superstar has some opportunities to improve. When I defined a group of 4 CCB Arches and choose Insert Superstar - Superstar opened up as expected showing the 4 arches, and gave me the 4 matrix lines to program with. The problem I find is with the more complex structure of the 12CCR tree, and the 12 CCR tree along with its 6 channel star. It appears that the Insert Superstar sequence is limited to working on GROUP elements. When I tried to grab a series of ROWS, I did not have an Insert Superstar option. It was only when I choose either a single ROW, or had a GROUP defined in a single ROW what the option appeared. 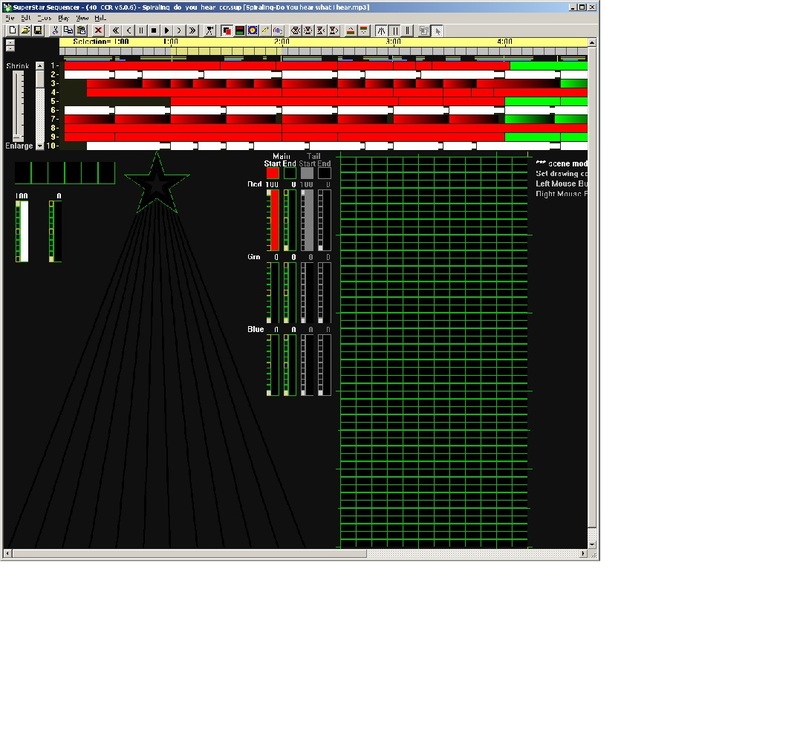 I did create a 12CCR Tree group - choose that row/Insert Superstar and got a Superstar window with one window showing 12 pixel strings in the shape of the tree - but the Superstar matrix, where I would control the on/off lighting and define the morphs - was only 8 elements wide, not the 12 I expect. When I went to run this in Superstar, the music ran, but nothing was shown on the UI. That sequence was showing in the S5 UI. - I think I will pull this item into a bug report and open it there. Let me expand a bit on this. The image attached shows the result of S5 opening Superstar to edit a 4 Arch group of CCB's. The CCB group is defined using "Use Preview" as an Arrangement (not sure which one to pick) - as a result, I do see the four arches in the order I expect - BUT, the programming matrix is something of a mixed up blob and i have to guess which matrix cell I should select (on/off), or run a morph through to create patterns. I had turned on the first element seqment. 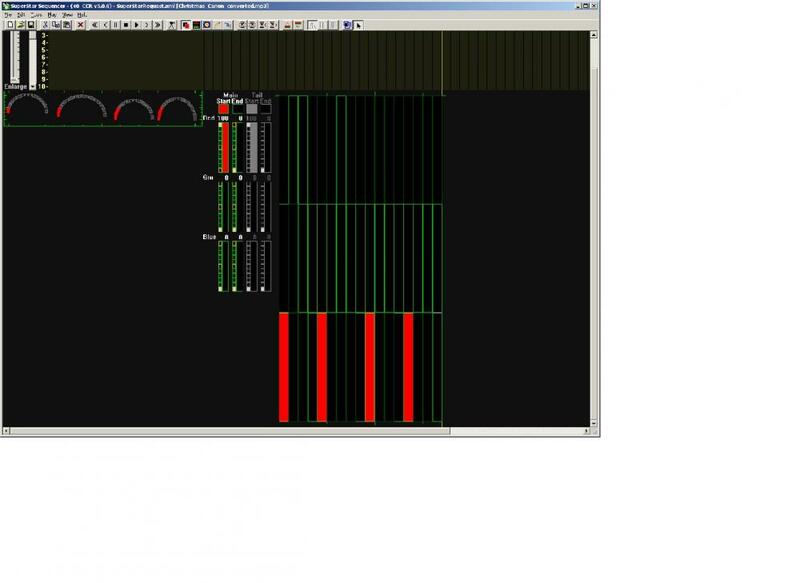 Each arch is set as a predefined Arch, 1 Section, 50 RGB nodes, starting Left. The four CCB arches are LOR addressed as Unit 6,7,8,9. What I would like to see -is a left to right, top to bottom arrangement of the programming matrix cells- maybe just one Column/matrix for each arch so that the left most Arch element (set at #1) is at the top of each column. The arches show as expected - but the programming colums are not as expected. I have resolved the S5 ->Superstar arrangement issue with my 4 CCR arches. By setting the GROUP Def to be NESTED, I get this ARCH / Config setup in Superstar which is what I wanted.